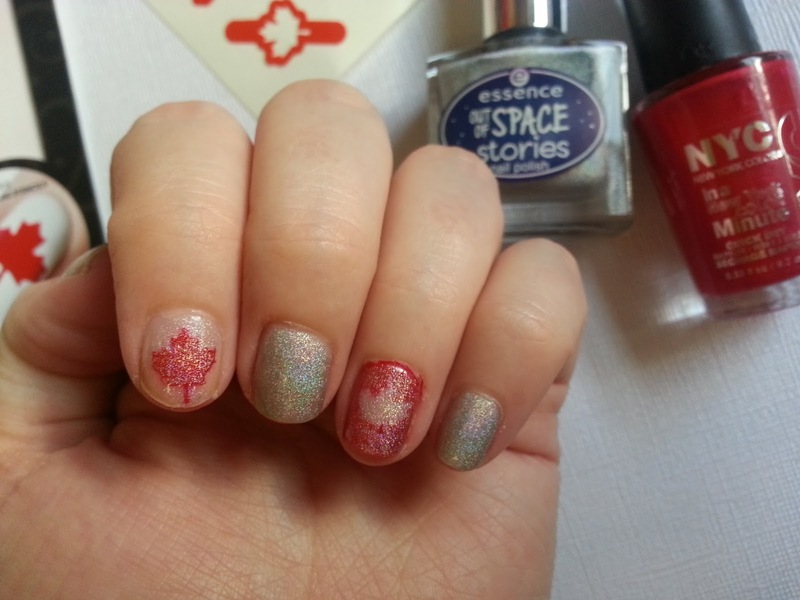 Deidre's Discoveries: Canada Day Inspired Nails! Some Canadian beauty bloggers were sent nail decals with the Canadian leaf print! They were each given a promo code to give away 10 sheets each. I took advantage of this offer through one of the other bloggers and got a sheet for myself! You can find out here who else still is offering this promo! Anyway, with Canada Day coming up soon (July 1st!) I decided I wanted in on the themed nails, and this is what I came up with! I wanted to keep it pretty simple, because I'm pretty boring when it comes to my nails! 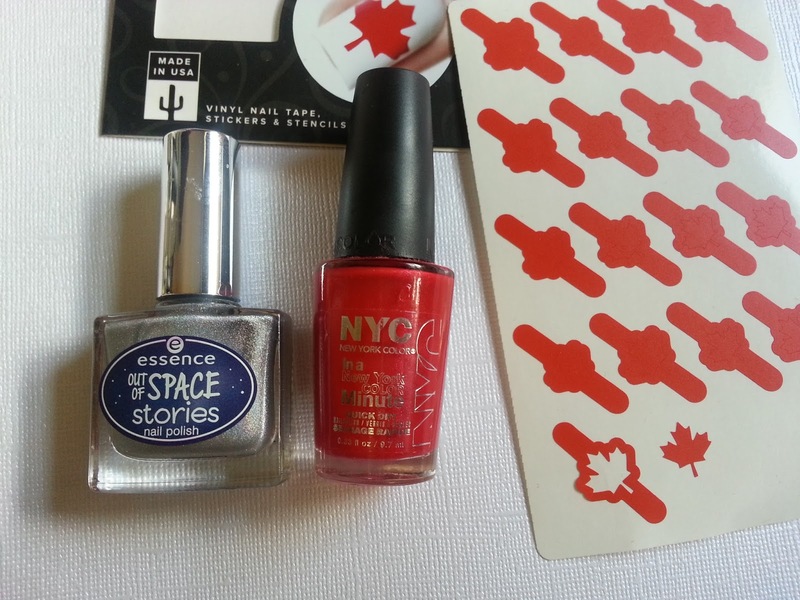 Essence - Out of Space Stories nail polish in we will spock you! I applied the sticker with the empty centre on my pointer fingers. I then placed the actual leaf sticker on my ring fingers. I went in with Madison Avenue on those fingers as well... filling them both completely with polish. I only used one coat. I then peeled off the stickers using tweezers, and then painted the rest of my fingers (thumb, middle, and pinky) with two coats of the we will spock you polish. Once my leaf fingers were dry, I applied one thin coat of we will spock you over top to make them all glitter! Overall, these were very easy to use! I did have some difficulties removing the solid leaf print from my nail (which is why tweezers were super handy) and I found that the polish didn't look as clean/sharp as the nails with the empty middle leaf pattern. I'd definitely consider using this brand in the future for some nail inspiration! 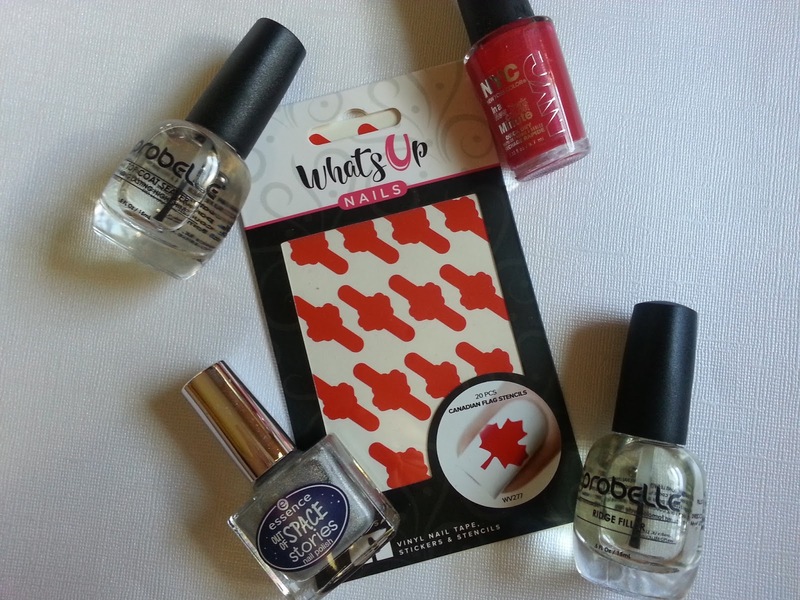 Labels: canada day inspired nails , essence out of space stories , madison avenue , nail polish , nails , nyc nail polish , we will spock you!